Mongolian Chicken - tender and juicy Chinese chicken stir-fry with scallions and brown sauce. This Mongolian Chicken recipe is so much better than takeout. We all love Mongolian Beef, but today I am shaking things up with Mongolian Chicken, which is even better as most people love and eat chicken. This recipe is the epitome of Chinese stir fries; silky, tender, velvety and juicy pieces of chicken marinated and coated with corn starch, and stir-fried with the delicious brown sauce. If you follow my recipes, I am very sure you can make restaurant quality Chinese food at home that taste much better than takeout! Now let’s talk about the secret techniques of making the best Mongolian chicken at home. First of all, you will need ginger and garlic. They impart amazing aromas to the chicken. Secondly, the sauce should be a bit thick but still runny, and not overly starchy. Make this for dinner tonight and enjoy! 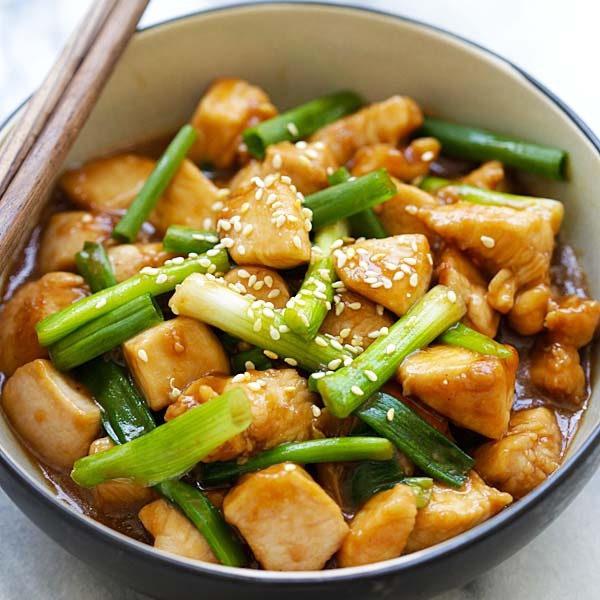 Mongolian Chicken – tender and juicy Chinese chicken stir-fry with scallions and brown sauce. This Mongolian Chicken recipe is so much better than takeout. Marinate the chicken with soy sauce, rice wine (if using), sesame oil and corn starch. Stir to mix well. In a small bowl, mix all the ingredients for the Sauce together. Stir to mix well. Set aside. Heat up a skillet or wok on high heat. Add 1/2 tablespoon oil and add the chicken. Toss and stir fry until the surface turns white but not completely cooked. Dish out and set aside. Clean up the skillet or wok with paper towels, and add the remaining 1 tablespoon cooking oil. When the oil is heated, add the garlic and ginger, stir fry until aromatic. Add the chicken and do a few quick stirs before adding the Sauce. Stir continuously until the sauce thickens and the chicken is cooked through. Add the scallions, stir to combine well. Top the chicken with some sesame and serve immediately. If you prefer beef, please click here for the Mongolian Beef recipe. All photos and recipes on Rasa Malaysia are copyright protected. Please do not use the photos and recipes without prior written permission. If you wish to republish this recipe, please rewrite the recipe in your own words instead of copy and paste and link back to //rasamalaysia.com/mongolian-chicken/. Thank you very much! Thank you so much for sharing your recipes with everyone. I’ve been trying many of them, and I have been very pleased, with each of them. My families favorite so far, has been the Mongolian chicken, served with white rice. It makes an awesome dinner, with no complaints. ?? Thanks Brenda for trying my Mongolian Chicken recipe. Is this a well known American dish? I wonder what the history is behind it, and how it came to be known as “Mongolian” chicken. Yes it’s an American-Chinese dish. There is a Mongolian beef dish that is very popular and this is Mongolian Chicken. I’m assuming that when you say “white sesame” that you mean sesame seeds. Is that correct? ok, I know you will have a chuckle over this! I got tired of buying the soy sauce in the grocery store because the container is small and the soy sauce runs out pretty quickly. So I went to an Asian Market and bought a liter bottle of soy sauce! But everything I made with it – the sauce was a lot darker(and saltier) than I expected. In your Mongolian chicken recipe, for the main part you use soy sauce, but for the sauce part, you use dark soy sauce! That was sort of an aha moment for me! I went into the kitchen to see what kind of soy sauce, and sure enough it was dark soy sauce! Never knew there was anything but soy sauce and low sodium soy sauce, but I am wiser now!! That recipe looks really good too. My sister and I are going to an Asian restaurant tomorrow for lunch, and I was looking at the menu and did a google search on Mongolian Chicken. Since I enter your site’s giveaways, I was familiar with your site and checked your recipe first! There have been times I have been adventurous and ordered something that sounded interesting, and then when the meals arrived decided I should have ordered what my sister did! I think I won’t order the Mongolian Chicken but I definitely will try your recipe. I mostly use the crock pot or instant pot, but this recipe doesn’t take a lot of time, so I will have to try it out! Thanks for all your giveaways & your recipes!